For almost a year I had walked past a poster advertising, Ariel fitness classes, on Barrington street thinking; ‘That would make a good drawing.’, when one day I finally plucked up enough courage to go in and ask – this was the result. The position on the right is called, ‘The Man In The Moon’. Thank you to Christy and Cait at Studio InEssence for patiently hanging around while I sketched. Thanks Rosie, it’s really three drawings in one, all pasted together. Quite large scale, A1. 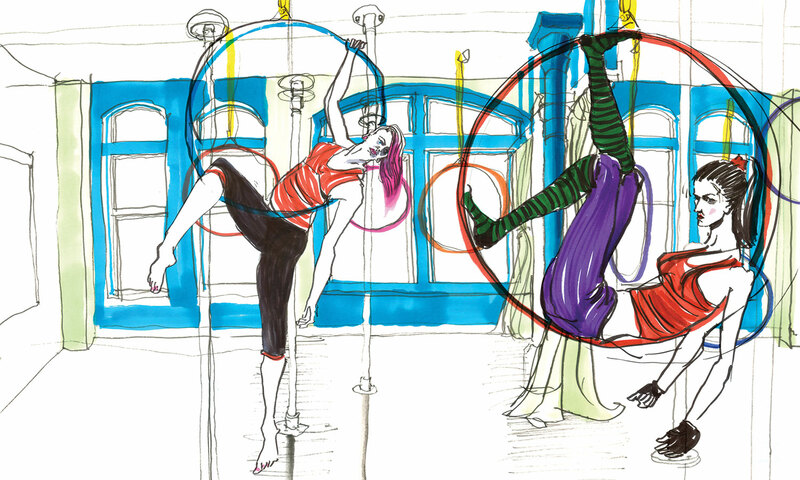 They do ariel Yoga in drapes too, hope to return and do some more drawing there. Russell. Oh great! You got your print, that’s good news. Enjoy the rest of your week, Russell.